Next Tuesday, February 5, marks the start of the Lunar New Year. (Xīn nián kuài lè!) And like all great holidays, this one is as much about the food as it is about the celebration. With three major Chinatowns and other Asian enclaves throughout the city, there’ll be no shortage of places to celebrate the Year of the Pig. Whether it’s going dumpling crazy, hitting up a museum celebration, or digging into a multicourse feast, here’s how to ring in the Lunar New Year in New York City. This thoroughly modern Chinese restaurant in Soho will mark the Lunar New Year with a series of specials that’ll be available from February 1 to February 10. 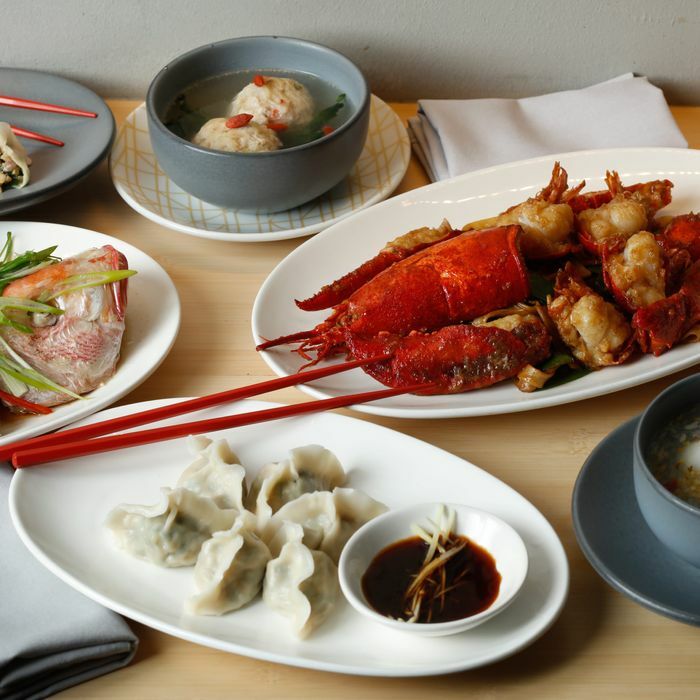 Diners can pig out on chicken and chive dumplings, a cabbage- and noodle-centric Lion’s Head meatball soup, Long Life noodles with lobster and shiitake mushrooms, New Year rice cakes, and a black sesame tang yuan with mochi and chrysanthemum-infused Chinese rice wine for dessert. Until the amazing Queens Night Market returns in the spring, the next best thing is checking out the Night Market that MOCA is organizing to celebrate the Lunar New Year. Tomorrow, drop by the Chinatown museum starting at 6 p.m. for food and drinks from Nom Wah Nolita, East Wind Snack Shop, Hey Hey Canteen, Ming River, Saffron 59, Tea Drunk, Silk Cakes, Bessou, and Taiwan Bear House. There will also be a Lion Dance, arts performances, and a cash bar if this is just your first stop on a night out on the town. Tickets are $88 for museum members and $99 for nonmembers. Purchase them here. If you’ve got a large group of people willing to throw down a serious amount of money in the name of the Lunar New Year, DaDong is at your service. On February 4 and 5, in addition to its à la carte offerings, the Chinese-born restaurant will serve three family-style meals, starting with a $598 menu featuring cherry foie gras, truffle-braised abalone, and red chili Wagyu, and topping out at the $1,188 meal with a roasted rack of lamb, braised sea cucumber, and more. All three meals will also feature DaDong’s headliner: the “SuBuNi” roast duck with pancakes and toasted sesame buns. For Lunar New Year, Simone Tong’s noodle shop is keeping things simple in the form of two specials. First, the chef will serve her own shengjian bao with pan-seared pork soup dumplings in black sesame vinaigrette. For the second special, Tong will serve Chinese BBQ baby back ribs prepared in a wet salt cure with Cantonese rose sorghum liquor, tahini, peanut sauce, Japanese raw sugar, and fermented tofu, with Shanghai bok choy and a maltose glaze alongside. Those who want to get right to the heart of Lunar New Year will want to head straight to Dumpling Galaxy, Flushing, Queens’ absolute best Chinese restaurant. To mark the holiday, the restaurant will serve up speciality dumplings, including cabbage and green onion-stuffed money dumplings, steamed rose-shaped dumplings, and hot pot dumplings for anyone who needs to warm up. If you happen to drop by on February 9, head over to Union Street and 37th Avenue to view the Lunar New Year Parade at 11 a.m. or make your way to the nearby Queens Botanical Garden, where celebrations will take place throughout the day, including an auspicious plant sale. Under the leadership of new head chef Kia Damon, this Cali-Mexican restaurant will pay homage to the surrounding Chinatown neighborhood with a dim sum-themed family meal. On Sunday, February 10, drop by to enjoy a menu featuring fried chorizo wontons, red curry snapper, pineapple veggie fried rice, good fortune flan, and more, produced in collaboration with Lalito regular and former Winnie’s employee Popeye. In honor of the start of the Lunar New Year, this relatively new Taiwanese-American restaurant has collaborated with Greenpoint’s Van Leeuwen ice cream company to produce a special Pineapple Cake flavor featuring caramelized pineapple jam housed between miso shortbread and folded into a vanilla-flavored sweet cream base. The ice cream will be available on a fried bun with spicy honey and candied bacon at 886 through February 9 and by the scoop at the East Village Van Leeuwen through February 6. Stop by this upscale Japanese home-cooking spot from February 3–5 to enjoy a three-course Sino-Japanese prix-fixe dinner in celebration of the new year. The menu will feature family-style small plates, including burdock root pickles, sesame slaw, Good Fortune greens, miso seafood hot pot, short rib and broccoli, and Mandarin Creamsicle ice cream with a fortune cookie crumble for dessert. The whole thing will set you back just $40. Grab a table via Resy or feel free to walk in. On February 5, Loosie’s Kitchen chef Henry Lu will celebrate his Chinese-American heritage with an aptly named “We Are All Pigs” party. Lu, who spent most of his childhood at his family’s Chinese restaurants in the Bronx, will serve fried spring rolls; steamed fish in ginger, galangal, and lemongrass water; pork belly-stuffed suckling pig; plus $5 cans of Tsingtao beer. To make a reservation, shoot an email to sayhi@loosieskitchen.com, or purchase a ticket here. This popular modern Chinese spot will serve a few specials on February 5 in the name of the Lunar New Year. Dishes will include black truffle chicken soup dumplings, chowder, fried rice, and grilled lobster with black truffle sauce. Be sure to dig further into the dim sum menu, especially RedFarm’s xiao long bao soup dumplings; they’re among the absolute best in the city. In its one year in existence, Madcap has proved to be one of the more eclectic restaurants to hit the Brooklyn scene in recent memory, whether they’re hosting an all-you-can-eat crab fest, a multicourse New Year’s Eve dinner, or a noodle-centric Lunar New Year dinner. On February 5, drop by this Carroll Gardens spot for a collaborative dinner with Chelsea Market mainstay Very Fresh Noodles featuring lychee martinis, duck steamed buns, exceedingly fresh dan dan noodles, XO bok choy, pineapple sorbet, and more for just $45 per person. Grab a table via OpenTable. For the eighth year running, this West Village spot will host a dim sum brunch. On Sunday, February 10 at 10 a.m., the kitchen team, in collaboration with Madison, WI–based chefs David Oliver and Matthew Stebbins, will serve up pork and shrimp shumai, kimchi fried rice with egg, tong mein noodles in ginger-lemongrass broth, and much more. There will also be arcade games that are sure to help fussy kids make it through the morning and afternoon. It’ll be walk-ins only until 4 p.m., so get there bright and early to avoid the rush. This Korean spot is keeping it pretty simple for the Lunar New Year: Drop by on February 5 and you can enjoy a traditional Korean rice soup made with ddeukguk. The cone-shaped rice cakes will be served in a rich short rib broth and topped with julienned egg omelets, scallions, and shredded seaweed. Be sure to order some fried chicken, too, since it’s some of the best the city has to offer.